THE BEST WAY TO RELAX WHILE READING A BOOK, DRINKING A GLASS OF WINE OR HAVING A NAP IS TO LIE DOWN IN THESE MOST COMFORTABLE HAMMOCK CHAIRS. The MAYAN chair is made with cotton or polyester and is large enough to stretch your legs. 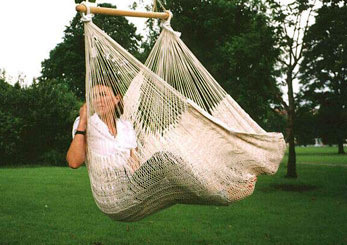 Our hammock chairs are woven with the unique 4-yarns technique exclusive to Mayan artisans from Yucatan.